Whinburgh and Westfield is a small parish situated in the Breckland Local Government District, with an area of some 753 hectares. The parish contains the settlements of Whinburch and Westfield, and situated immediately to the south of East Dereham. The name ‘Whinburgh’ is thought to derive from the Old English for fortified place overgrown with furze, and the name ‘Westfield’ from the Old English for western open land. The earliest objects to be recovered from the parish are two Neolithic polished flint axeheads (NHER 2763 and 2764), followed by a Bronze Age looped palstave (NHER 8832) a prehistoric flint flake (NHER 40027) and a prehistoric pot boiler site (NHER 36292). The earliest monuments to be recorded are two possible Bronze Age ring ditches and linear ditches (NHER 36391), the cropmarks of which were recorded by aerial photography in 1996. No monuments from the Roman period have been recorded, however a small number of objects are known. These include a coin minted under the emperor Claudius II (NHER 8833), pottery sherds (NHER 39956) and four brooches (NHER 39998, 40298 and 40299), one of which was shaped like a dolphin (NHER 40027). Even less evidence is available for the Saxon period, from which only a Middle to Late Saxon hooked tag and a Late Saxon coin have been discovered (NHER 40299). However both Whinburgh and Westfield are mentioned in the Domesday Book of 1086, and it is interesting to note that Whinburgh is listed as having a church and Westfield a mill. It is uncertain whether anything survives of these two structures, although it is possible that the Saxon church in Whinburgh may be under the foundations of the medieval church of St Mary (NHER 8856). All of the present church appears to have been built around 1300, although traces of older work do survive. In addition to the church, the earthworks of a moated enclosure at Manor Yards (NHER 8852) also survive, as well as the earthworks and cropmarks of an enclosure and ridge and furrow (NHER 2771). 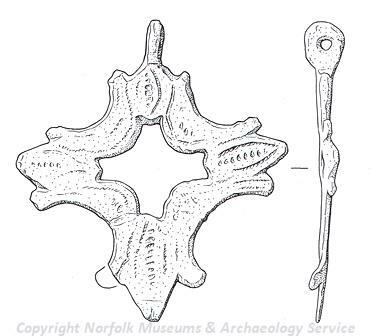 Medieval objects have also been recorded, including pottery sherds (NHER 21696 and 37478), and harness pendants and coins (NHER 40298 and 40299). Similar objects have been recovered from the post medieval period. From more recent history, the site of the East Dereham Royal Observer Corps (NHER 35398) post also lies within the parish. It was opened in December 1958 and closed in October 1968, and is thought to survive largely intact.